At the age of thirty-six he was summoned to Rome by Pope Paul III (1534–1549), under whom he held successive appointments as first judge of the capital, abbreviator, and vice-chancellor of the Campagna. 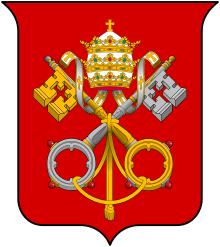 Pope Paul IV (1555–1559) attached him as datarius to the suite of Cardinal Carlo Carafa, Pope Pius IV (1559–1565) made him Cardinal-Priest of San Sisto Vecchio and sent him to the Council of Trent. 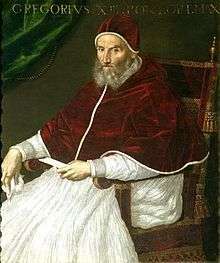 Upon the death of Pope Pius V (1566–1572), the conclave chose Cardinal Boncompagni, who assumed the name of Gregory XIII in homage to the great reforming Pope, Gregory I (590–604), surnamed the Great. It was a very brief conclave, lasting less than 24 hours. Many historians have attributed this to the influence and backing of the Spanish King. Gregory XIII's character seemed to be perfect for the needs of the church at the time. Unlike some of his predecessors, he was to lead a faultless personal life, becoming a model for his simplicity of life. Additionally, his legal brilliance and management abilities meant that he was able to respond and deal with major problems quickly and decisively, although not always successfully. A central part of the strategy of Gregory XIII's reform was to apply the recommendations of Trent. He was a liberal patron of the recently formed Society of Jesus throughout Europe, for which he founded many new colleges. The Roman College of the Jesuits grew substantially under his patronage, and became the most important centre of learning in Europe for a time, known as the University of the Nations. 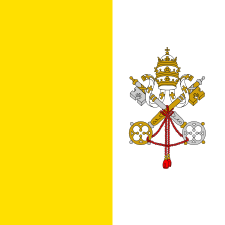 It is now named the Pontifical Gregorian University. Pope Gregory XIII also founded numerous seminaries for training priests, beginning with the German College at Rome, and put them in the charge of the Jesuits. Pope Gregory XIII is best known for his commissioning of the calendar after being initially authored by the Calabrian doctor/astronomer Aloysius Lilius and with the aid of Jesuit priest/astronomer Christopher Clavius who made the final modifications. The reason for the reform was that the average length of the year in the Julian calendar was too long – it treated each year as 365 days, 6 hours in length, whereas calculations showed that the actual mean length of a year is slightly less (365 days, 5 hours and 49 minutes) As a result, the date of the actual vernal equinox had slowly (over the course of 13 centuries) slipped to 10 March, while the computus (calculation) of the date of Easter still followed the traditional date of 21 March. The Gregorian calendar was not accepted in eastern Christendom for several hundred years, and then only as the civil calendar. The Gregorian Calendar was instituted in Russia by the Bolsheviks in 1917, Romania accepted it in 1919 under king Ferdinand of Romania (1 November 1919 became 14 November 1919), Turkey in 1923 under Atatürk, and the last Orthodox country to accept the calendar was Greece also in 1923. While some Eastern Orthodox national churches have accepted the Gregorian calendar dates for feast days that occur on the same date every year, the dates of all movable feasts (such as Easter) are still calculated in the Eastern Orthodox churches by reference to the Julian calendar. The Japanese ambassadors of Tennsho, Keisho, headed by Mancio Ito to Pope Gregory XIII in 1585. Though he expressed the conventional fears of the danger from the Turks, Gregory XIII's attentions were more consistently directed to the dangers from the Protestants. He also encouraged the plans of Philip II to dethrone Elizabeth I of England (reigned from 1558–1603), thus helping to develop an atmosphere of subversion and imminent danger among English Protestants, who looked on any Roman Catholic as a potential traitor. 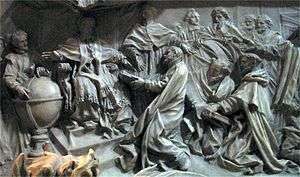 After the St. Bartholomew's Day Massacres of Huguenots in France in 1572, Pope Gregory celebrated a Te Deum mass. However, some hold that he was ignorant of the nature of the plot at the time, having been told the Huguenots had tried to take over the government but failed. Three frescoes in the Sala Regia Palace of the Vatican depicting the events were painted by Giorgio Vasari, and a commemorative medal was issued with Gregory's portrait and on the obverse a chastising angel, sword in hand and the legend UGONOTTORUM STRAGES ("Massacre of the Huguenots"). 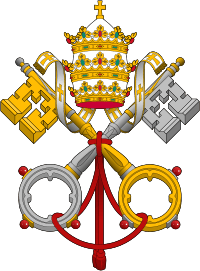 He appointed his illegitimate son Giacomo,[lower-alpha 1] born to his mistress at Bologna before his papacy, castellan of Sant'Angelo and Gonfalonier of the Church; Venice, anxious to please, enrolled him among its nobles. Philip II of Spain appointed him general in his army. Gregory also helped his son to become a powerful feudatary through the acquisition of the Duchy of Sora, on the border between the Papal States and the Kingdom of Naples. In order to raise funds for these and similar objects, he confiscated a large proportion of the houses and properties throughout the states of the Church. This measure enriched his treasury for a time, but alienated a great body of the nobility and gentry, revived old factions, and created new ones. Gregory XIII died on 10 April 1585. ↑ Ugo Boncompagni had Giacomo legitimated on 5 July 1548 by the bishop of Feltre. ↑ "The Cardinals of the Holy Roman Church: Ugo Boncompagni". Fiu.edu. 2007-12-03. Retrieved 2013-06-23. ↑ Henry, Jonathan. "Chapter 3." Earth Science. Clearwater, Fl: Clearwater Christian College, 2010. Print. ↑ Schaff, Philip (1910). History of the Christian Church, Volume VII. Modern Christianity. The German Reformation. New York: Charles Scribner's Sons. Note 53. This article incorporates text from a publication now in the public domain: Herbermann, Charles, ed. (1913). "Pope Gregory XIII". Catholic Encyclopedia. New York: Robert Appleton.